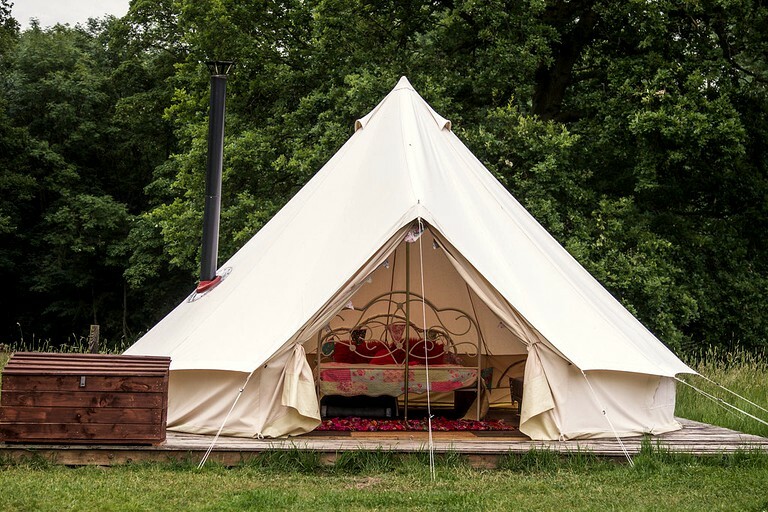 These bell tent rentals in England can each accommodate up to five guests. Each has one double-sized bed, one double-sized sofa bed, and one single-sized sofa/Z bed. 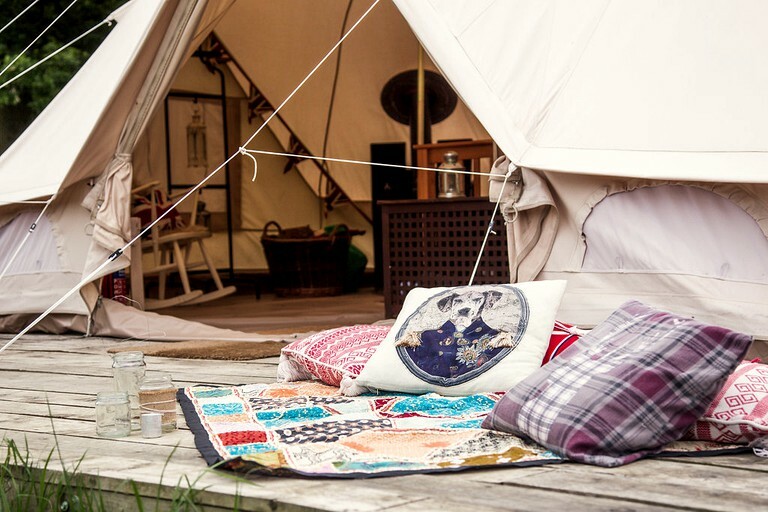 These light and airy canvas bell tents are perfect for relaxing days as guests and their pets can lounge by the log fire overlooking the beautiful green meadow on site. 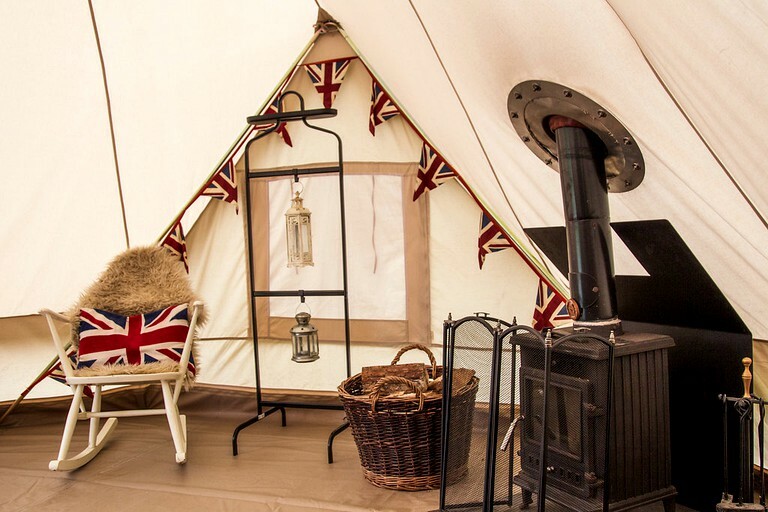 These bell tents are generously equipped with a log burner, a basket of logs, a pack of fire lighters and matches, candles, string lights, cushions, and a lantern. Outside, guests will find a BBQ, a fire pit, and a table and chairs, which are ideal for relaxing with a furry friend. The toilet and shower block is a two-minute walk away. The pet-friendly site has an outdoor eco-spa and sauna set on the edge of a tranquil woodland. This eco-friendly, wood-fired hot tub is hand-crafted from Siberian spruce and can accommodate up to six guests. The hot tub is open to the elements and will lull guests into total relaxation as they listen to the sounds of nearby wildlife as the sun sets. Even on the coldest of days or nights, guests will feel cocooned and warm. The hosts suggest that guests pre-order a bottle of chilled champagne, borrow a musical instrument from the music den, light some candles. and let the string lights twinkle for an evening of bliss. There is also a wood-burning barreled sauna that will comfortably accommodate six guests on site. It is advised that guests take a cold shower beforehand to feel the full benefits of the heat sizzling through their muscles. The site has a BBQ Grill Cabin that can comfortably seat up to 15 adults. BBQ meat and fondue dessert hampers can be pre-ordered for an extra fee. One bag of charcoal, a box of matches, paper plates, and plastic cutlery are supplied in the BBQ grill fee. 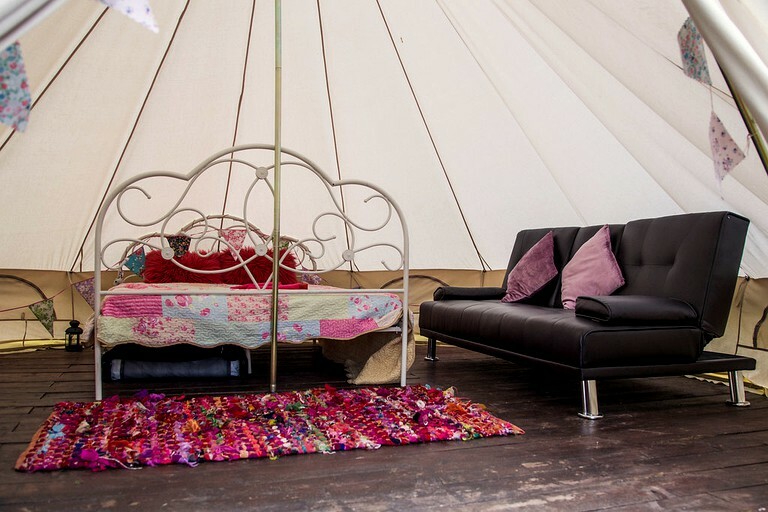 Bicycles can be rented at this glamping site. On site, guests can have a Camp Hill treetop adventure, go on a climbing wall, soar on a zip wire, and try out an adventure playground. They can also go on segway treks or quad biking, and there are even opportunities for outdoor Bivouac shelter building. This site has a putting green, quoits and skittles, a boot camp, an assault course, a pontoon bridge, off-road buggies, rage off-road buggies, and powerturn buggies, and there are opportunities for 4x4 blindfold driving, raft building, clay pigeon shooting, archery, falconry, orienteering, scavenger hunts, and Taste the Wild cooking. There are also workshop and retreat weekends such as yoga retreats and boot camps. The site offers an endless array of activities contained within what they call a ”big playground”. There are many activities for guests to enjoy with or without their pet. Indoor activities include wine tasting, cupcake decorating, craft workshops, pamper sessions, life drawing classes, cocktail-making classes, and burlesque workshops. Well-behaved dogs are welcome at this site, although their owners must take full responsibility for them. Guests should note that both the Cafe and Adventure activities are a separate business from the glamping site, even though they share the same location. Only a limited selection of activities are available during off-peak periods, including mid-week days out of school holidays. The Cafe is also only open during weekends and school holidays, not mid-week or off-peak.